The 2017 Lincoln MKZ, a midsize luxury sedan, comes in four trims: Premiere, Select, Reserve, and Black Label. 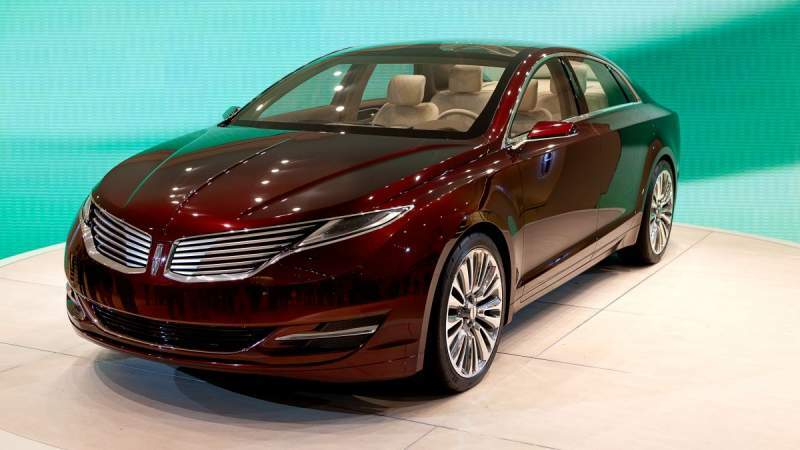 Lincoln also offers a hybrid version of the MKZ. The exterior features the Lincoln signature grille, 19-inch machined-aluminum spoke wheels, and dual-chrome integrated exhaust tips. With sculpted pillar and door-trim, Bridge of Weir leather-trimmed seating, and a Wollsdorf-leather-wrapped steering wheel, the inviting interior of the 2017 Lincoln MKZ defines luxury. Add the ambient lighting with seven color schemes to match your mood, and you have a car that makes driving enjoyable, whether you are in traffic or on the open road. Active noise control provides a quiet ride, and with the push of a button, the panoramic sunroof slides back giving you an open air ride. The redesigned, intuitive central control panel reduces the previous interior focus on buttons, knobs, media ports, and electrical outlets. The interior of the MKZ hybrid was designed to be almost identical to it’s non-hybrid counterpart, and the MKZ hybrid is the only luxury midsize hybrid sedan that has the same base price as its non-hybrid counterpart. You will not sacrifice any of the MKZ luxury for better fuel efficiency. The 2017 Lincoln MKX is 194″ long, 73″ wide, and 58″ high with a 112″ wheelbase. The passenger area is 96 cubic feet, and the luggage area is 11 cubic for the hybrid model and 15 cubic feet for the non-hybrid models. It has MacPherson struts with stabilizer bar and aluminum lower control arms in the front and independent integral link with stabilizer bar and aluminum lower control arms in the rear. It also has power four-wheel disc brakes with Anti-Lock Brake System (ABS), regenerative braking, and electronic brake force distribution. The 2.0-liter FWD model holds 16.5 gallons of fuel, and the 2.0-liter AWD model holds 18 gallons of fuel. The hybrid model holds 14 gallons of fuel, and the 3.0-liter model holds 18 gallons of fuel. The Premiere starts at $35,170 MSRP, the Select starts at $36,920 MSRP, the Reserve starts at $39,670 MSRP, and the Black Label starts at $47,830 MSRP. The 2017 Lincoln MKZ offers three engines: the 2.0-liter, 245-horsepower, GTDI, turbocharged, I-4 engine; the 2.0-liter, 188 net system horsepower, Atkinson-Cycle, I-4, Hybrid Engine; and the 3.0-liter, 350-horsepower (FWD) or 400-horsepower (AWD), GTDI, twin-turbocharged, V6 engine. The non-hybrid models have a six-speed, push-button, Selectshift, automatic transmission. The hybrid model has an eCVT transmission. For better driving performance, the Lincoln MKZ also offers a Driver’s package on the 3.0-liter, AWD model. The package includes sport-tuned suspension, Dynamic Torque Vectoring, and revised continuously controlled damping. You can also select a suspension driving mode manually. Your choices are normal, sport, and comfort. For more controlled, responsive steering, the MKZ has electric power-assisted steering. For the safety of you and your family, the MKC has the standard safety features. The adaptive cruise control with stop and go capability uses radar to monitor the speed of traffic in front of you. Then, it will automatically slow your car down to match the speed of traffic ahead or increase your car’s speed back to your set speed if traffic allows. It can also slow your car to a stop in stopped traffic and start your car moving again when traffic starts moving again. The adaptive HID headlights turn in unison with the steering wheel for better visibility on curves and turns. As you approach the MKZ, the Approach Detection System illuminates the driver’s door handle and the ground beside the driver’s door. The enhanced active park assist feature uses ultrasonic sensors to help you safely park and leave both parallel and perpendicular parking spaces. Pre-collision Assist with Pedestrian Detection is another safety feature that is available. Radar and a camera monitor the road ahead for other vehicles or pedestrians. If anything is detected, you receive a warning. If you do not react quickly, the system will apply the brakes and slow your car down. The 2017 Lincoln MKX comes with voice-activated Sync 3, which provides SiriusXM Satellite Radio, Sync AppLink, automatic 911 Assist in emergencies, and hands-free calling from compatible phones with calls transmitted through your car’s speakers. If you have climate control, you can use the Sync 3 to adjust your settings with voice commands. SiriusXM Travel and Traffic Link are also available with the Sync 3. The MyLincoln Mobile App with Embedded Modem remotely connects you with the MKZ, so you can remotely start, lock, unlock, and locate your car. For your listening pleasure, you can choose the 14-speaker Rebel Audio System or the 20-speaker Revel Ultima System. For your electronics, there are four USB charging ports with two of them in the rear seat area. How Does the 2017 Lincoln MKZ Compare with Its Competition? A few things really stand out with the 2017 Lincoln MKZ. The first is the new 400-horsepower engine on the 3.0-liter AWD model. It is the most powerful engine in the midsize luxury sedan class. This adds some driving excitement to this luxury sedan. The second big news is that the Lincoln MKZ hybrid loses very little in luxury detail and costs the same as it’s non-hybrid counterparts. This sets it above it’s competition, whose hybrids are priced higher than their non-hybrid counterparts. In a comparison with the Lexus ES, Topspeed.com pointed out that the ES is very similar in many areas to the MKZ, including the price, but the Lexus ES only has a 270-horsepower engine. The fuel efficiency of the hybrid version is the best, and since the price and the features are similar to the non-hybrid versions, it might be the MKZ model to consider. The 2.0-liter FWD MKZ gets 21 MPG in the city, 31 MPG on the highway, and 24 MPG combined. The 2.0-liter AWD MKZ gets 20 MPG in the city, 28 MPG on the highway, and 23 MPG combined. The Hybrid MKZ gets 41 MPG in the city, 38 MPG on the highway, and 40 MPG combined. The 3.0-liter FWD MKZ gets 18 MPG in the city, 21 MPG on the highway, and 27 MPG combined. The 3.0-liter AWD MKZ gets 17 MPG in the city, 26 MPG on the highway, and 20 MPG combined. The Lincoln MKZ is built on the Ford Fusion platform and has been very similar in styling in the past. Much of that has changed with the 2017 Lincoln MKZ, and yet, the rear of the MKZ could use some more redesigning to make it look a little more luxurious. However, the MKZ offers many features as standard that competitors treat as extras. That makes the MKZ a better value than its competition. The new 400-horsepower, turbocharged, V6 engine also places it ahead of its competition. Finally, offering the hybrid version with very similar features at no extra charge makes the 2017 Lincoln MKZ a midsize luxury sedan to seriously consider.